Garmin has officially announced the Vivoactive HR, the successor to one of the surprise smartwatch hits of last year. Building on its predecessor, the Vivoactive HR has all of the same great smartwatch features including notification support and 24/7 activity tracking. This time, Garmin has added its own Elevate optical heart rate technology into the mix as well. That's the same tech packed into the Vivosmart HR fitness tracker and the Garmin Forerunner 235 running watch, letting you monitor heart rate data continuously and get a more accurate indication of your calorie burn during the day and night. It's also adding a barometric altimeter, which might be a staple on Garmin's sports watches, but now means you can track elevation, which is handy for hilly run training. Elsewhere, it still uses the same touchscreen colour display and has GPS on board so you can track your runs outdoors. There's still dedicated apps for running, cycling, golf and swimming plus added support for paddle boarding and skiing. There's the addition of the new Garmin Move IQ mode, that'll automatically recognise activities like walking, running, swimming and elliptical training. It's like the SmartTrack feature you get on Fitbit's trackers basically. You can still connect to the Garmin Connect IQ store to add apps, data fields, and watch faces and review all of your data in the steadily improving Garmin Connect companion app. In terms of battery life, Garmin claims you can expect 8 days battery life with continuous activity and heart rate tracking switched on. When you put the GPS to good use, you can expect up to 13 hours of playtime. 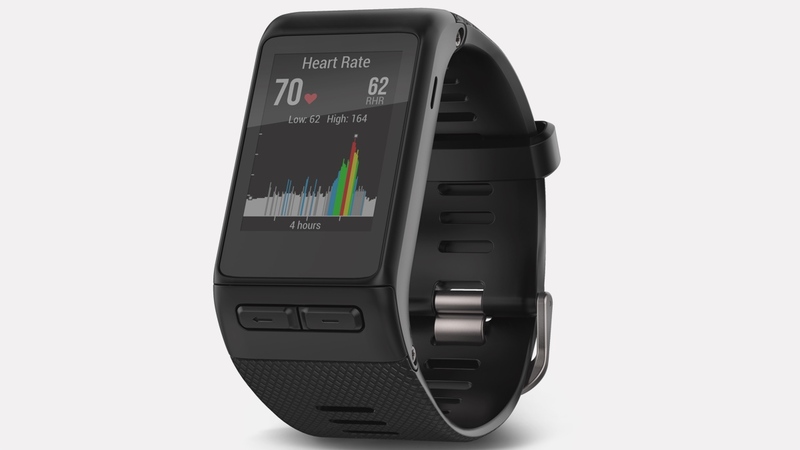 The Vivoactive HR is priced a little more expensively than the original Vivoactive coming in at $249.99. There's no news on a release date yet, but the Garmin website does indicate a processing time of 5-8 weeks, so it might be a month at least before you can get your hands on it. The good news is that it will be out in Barcelona at MWC, so we'll definitely get our hands on one and let you know if it makes a good first impression.